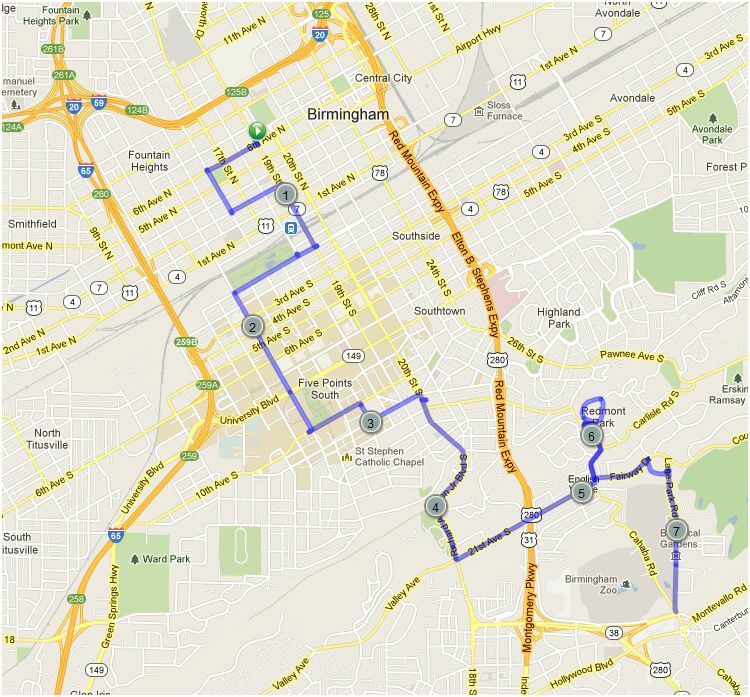 I jumped at the offer to show off a run through Birmingham—an underrated city with fabulous schools, beautiful topography, world-class restaurants, and great people, including a vibrant running community. We even claim Iron Chef Chris Hastings, Southern Living magazine, a Sidewalk Film Festival, the nation’s oldest baseball park, the largest museum collection of Wedgwood in the world, the largest collection of vintage and modern motorcycles, racecars and Lotus cars in the world, and yes, two American Idol winners. I begin my route at Linn Park downtown, where many local races begin and end. It was at Linn Park that I finished my first half marathon, cheered on by local running coach Danny Haralson of Run University. Seeing a few extra pounds on the scale and inspired by my friend Jennifer Andress, I signed up for Run University’s Couch to 5k program somewhat on a whim. I had never run, didn’t really think I could run, and really never wanted to run. When I got to the far side of the track in high school, I just moved my arms. I was that kid. With a brand of motivation that encouraged me to believe in all I could do, Danny Haralson taught me to run, first in steps, then mile by mile. After my first 5k I remember thinking that I’d never before run 3 miles on purpose. That 5k became a 10k, and later, half marathons. Along the miles I made some dear friends and learned a great deal about myself. If I had gone through most of my life thinking I couldn’t run, and it turns out that I can, and that I actually like it—what else can I do? Mark Twain said, “Keep away from those who try to belittle your ambitions. Small people always do that, but the really great make you believe that you too can become great.” That’s Danny Haralson. Not just for me, but for hundreds. The first stop on my route takes us to Kelly Ingram Park, just across from the Birmingham Civil Rights Museum and the 16th Street Baptist church. The park is a great place to acknowledge the city’s history and celebrate our progress. It’s here, at the edge of the Freedom walk, that I paused to thank my Mom. 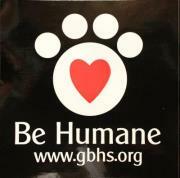 In the face of instability, she provided unconditional love and was so much better than she knew. She gave me roots, and she gave me space to grow, and her example continues to teach me as a parent. 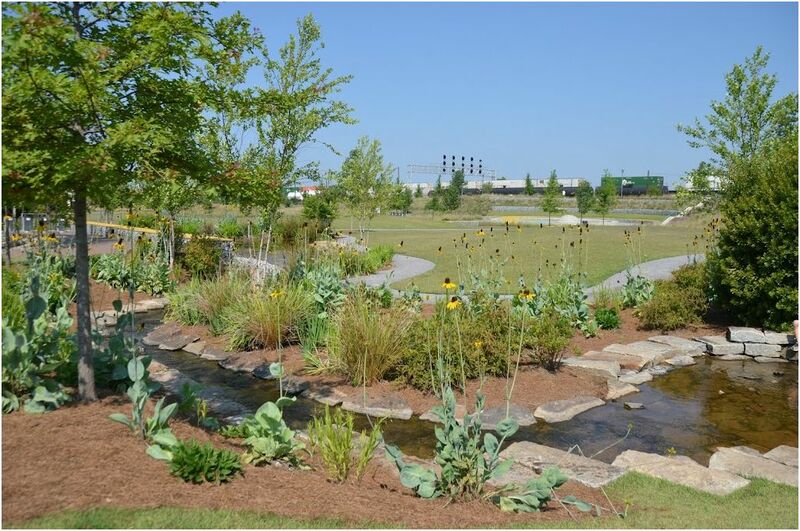 A short distance from this park is a gem of downtown—Birmingham’s Railroad Park. 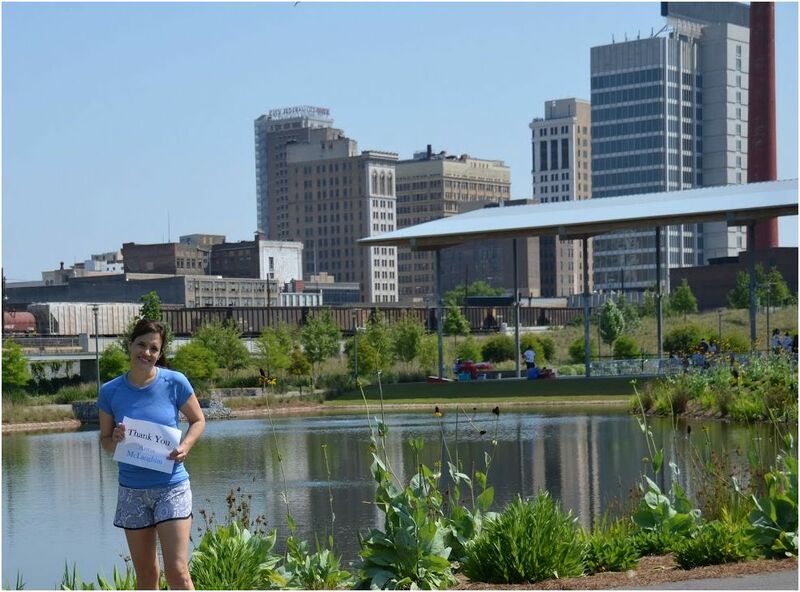 Railroad Park is a green space that sits along the railway and connects the downtown and Southside areas; it’s the perfect place to hang out or host an event (and it’s always a really great water stop for runners). The park looks over the city’s tallest buildings, and that makes it a good spot to thank my friend and former boss from my banking days in one of those towers. Anna McLaughlin is real, and she’s funny. 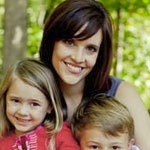 She taught me my job in Human Resources, but she also taught me about work, life, priorities, and being a Mom. She put up with me for more than 10 years (and that was mostly pre-babies so she didn’t get the mellower version of me). I am grateful for Anna’s wit, knowledge, and for helping me figure out what matters. 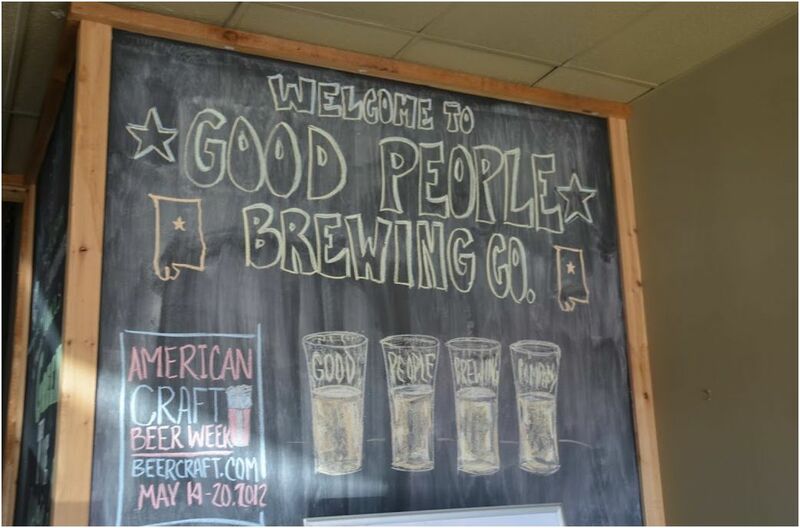 Just down the street from Railroad Park, we make a quick stop at local Good People Brewery. The owners are good people, and today, we actually found one of them (Jason) outside at work. I’m not a beer drinker, but I have it on good authority that this “stuff” is great, as somebody in our house repeatedly sends me out for the Snake Handler double IPA. 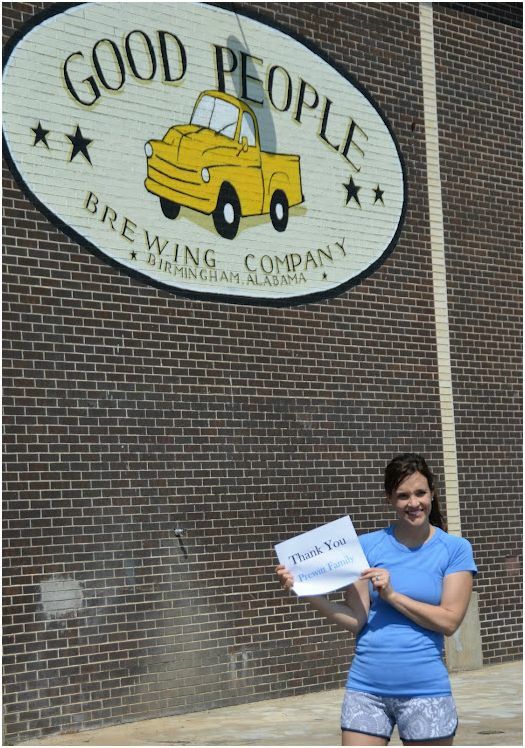 Good People seemed like a great place to thank some other good people—The Prewitt Family. We met the Prewitts when our sons landed in the same kindergarten class, and our 4 kids became fast friends. Tommy is a great Dad and friend to my kids, and Cindy has become “my person.” She takes care of the kids when I travel, listens to my endless yacking, brings dinner. In small ways and big ways, she has made me feel like family. I hope I occasionally have something to offer in return. From Good People we wind through the campus of the University of Alabama at Birmingham, the 2nd largest academic medical center in the nation. UAB is also the largest hospital in Alabama and 14th largest in the nation. 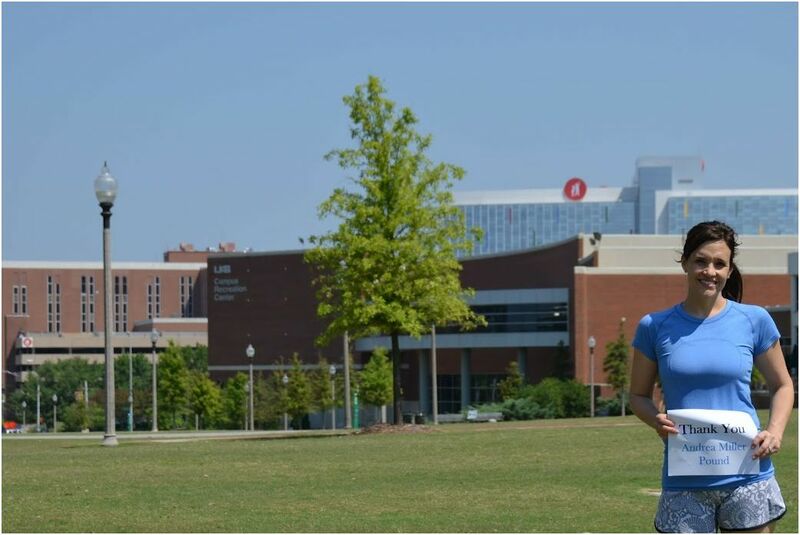 I love to run by the Campus Green, a space that is set against the Campus Recreation center and our Children’s Hospital, and it’s here that I thank my friend (and UAB employee) Andrea Miller Pound. Andrea and I met through Zeta Tau Alpha volunteer work. I liked her immediately, but when we went (both quite pregnant) on a ZTA recruitment visit and she was crawling around on her pregnant belly helping build a recruitment display out of roofing tiles, I knew we’d be friends for life. She “gets” me; she supports me, and she amazes me, and I feel so lucky we crossed paths. 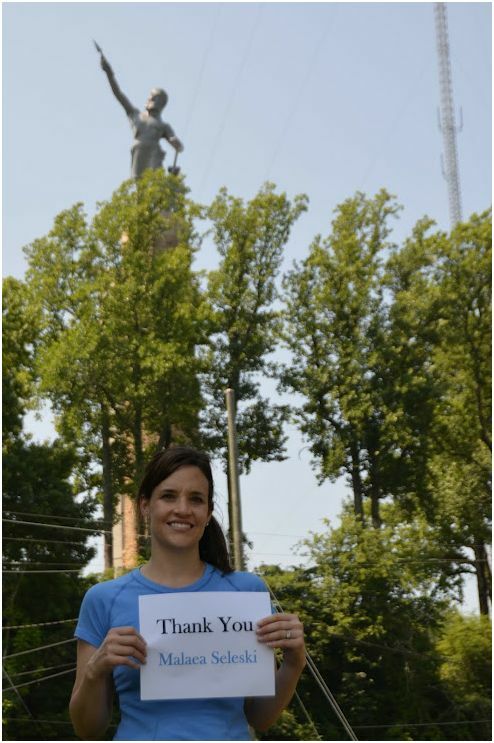 From UAB I headed into Southside and up a hill to the edge of Vulcan Park and the Vulcan statue. I’ll confess to walking the hill, and those of you who know where this is will understand. Vulcan, the God of metalworking, has overlooked the city since the 1930s. Designed by an Italian artist as Birmingham’s entry in the 1904 World’s Fair, Vulcan is the largest cast iron statue in the world, second in size only to the Statue of Liberty. I pause here to thank Malaea Seleski (and catch my breath from the hill!). Malaea and I met when we were both advisors to Zeta Tau Alpha chapters in Alabama. We later became close as I followed her into a regional position. Not a person on this planet is more kind, generous, and loving than she (she’s also absolutely beautiful and super-smart). Malaea exemplifies absolute selflessness and kindness. I am better every day because of her, and I hope to be half the friend she is. Everyone should have a Malaea in her life. From Vulcan I head into English Village, one of many of our city’s great local villages and frequent stop on many running routes. Today I run through the village and up the hill to a route some of us call “Three Sisters.” I think the “Three Sisters” moniker stems from the three hills on the route. 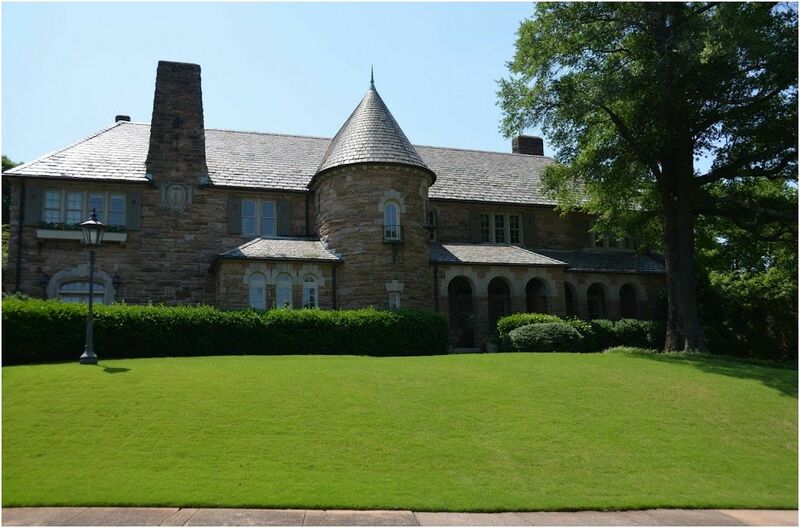 I chose to include this route because it includes a look at some beautiful homes and a great view of the city. It’s here on the Three Sisters route that I stop to thank three (well, 4) of my ZTA sisters: Julia Hill, Gloria Hice, Susan Beard, and Terri Millsap. Each of these ladies was an advisor to me, and each has had an enormous influence on the person I’ve become. I’ve spent a lot of my “adult” life advising ZTA chapters and working with collegians, and if I contribute anything to them, it’s because of these 4 ladies. The “a-ha” moments I had with them are too numerous to name, and each is also a special friend. I finish the run down from the overlook and back into the village, continuing on to the end of the route—downhill through beautiful wooded Mountain Brook, past our Botanical Gardens to the parking lot of the local Western grocery store, a spot where very soon I’ll meet friends for another good run. My final thanks goes to Chris, my photographer, the Good People drinker, and the one who puts up with me most. In honor of this group, I’ve made donations supporting the Zeta Tau Alpha Foundation, Girls on the Run Birmingham, and the Birmingham Humane Society. 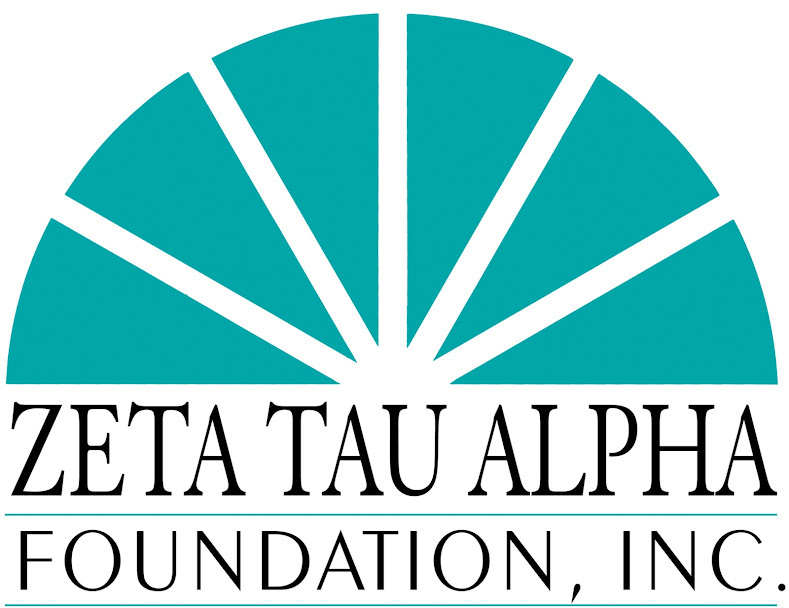 The Zeta Tau Alpha Foundation supports educational programming, leadership development, and and breast cancer research and awareness efforts. 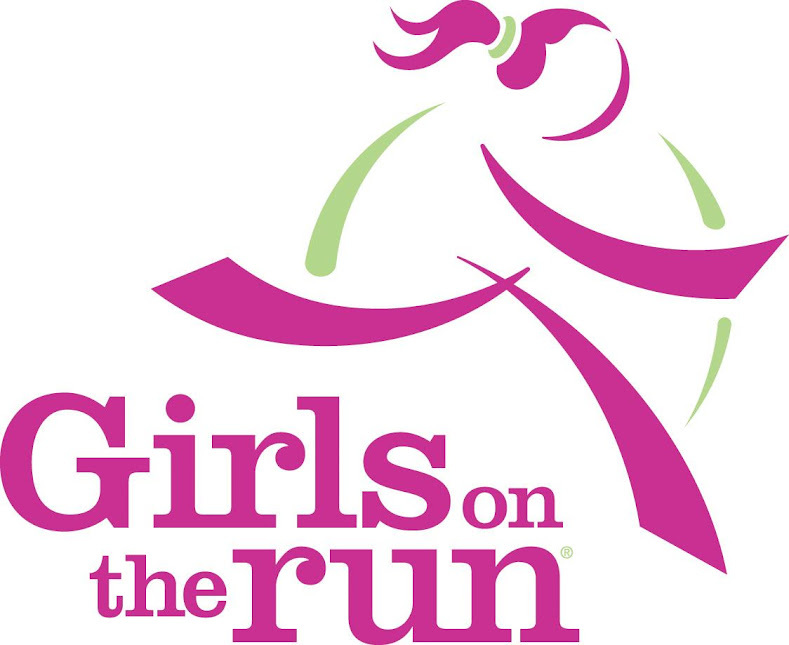 Girls on the Run Birmingham inspires girls to be joyful, healthy and confident, using a fun, experience-based curriculum that creatively integrates running.